I just seen Dora and Diego this past weekend at Universal Studios in Orlando. They were cruising along in their jeep having a fun time taking pictures with the excited children. My son got his picture taken with Spongebob. He said, “You know what Mom, now I really know Spongebob is real.” Yes, he sure is… We’re giving away an awesome Power Wheels Dora The Explorer Lil’ Quad to one lucky winner. Giveaway is hosted by Mom to Bed by 8. Enter to win below and good luck everyone! Hop on and hit the trail with the Power Wheels Dora the Explorer Lil’ Quad! Realistic details add to real driving fun for your toddler. Toddler-friendly features perfect for the littlest riders includes a large push-button on the handlebar for simple stop-and-go operation and built-in footrests. 6-volts of battery power are strong enough for real driving fun! All kids have to do is push the button and go! Ages 1-3 years old, weight limit is 40 lbs. 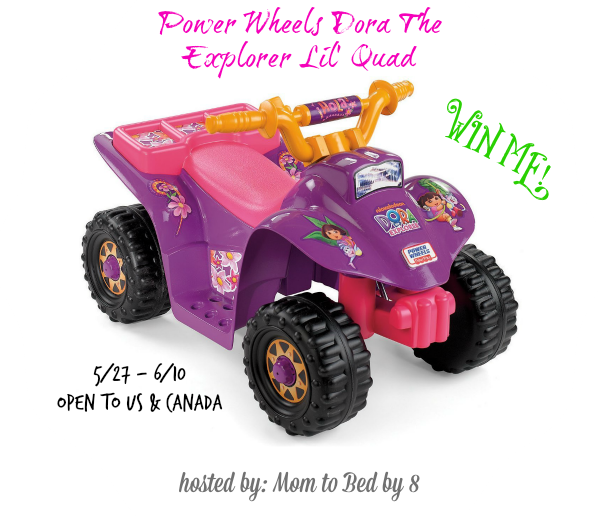 One lucky winner will receive a Power Wheels Dora The Explorer Lil’ Quad. Sweepstakes ends June 10th at 11:59pm CST. Entering the Giveaway Tools form below means you agree to terms above. Swimming is my favorite summer activity! Playing in the water with my grandbaby. My favorite summer activity is going on picnics! playing water balloon fight with my 4 year old. Swimming, I live in Arizona so it is our favorite thing to do! Crossing my fingers hope I win, my daughters 2nd bday is 7/1 & we are so broke :/ so this would make her bday great :)!!! We love spending the day at the lake , having a picnic , water skiing and swimming. I know this sounds bad, but laying right by the beach and working on a tan…I’m a California girl, what can I say!? We love camping and swimming! We love to go to the river! 4th of July picnic and fireworks!